Do you think you have what it takes to ship great software? I’ll let you in on a secret: it’s not easy and takes a lot of effort—but it’s all skills that you can learn. It’s a skill like any other to learn: design things for humans. I don’t mean visual design (though that is part of it), I mean looking at a problem and figuring out how to create human-computer interactions that make people successful at solving the problems without having a hard time, instead of just defaulting to putting up yet another CRUD form with a few standard UI components that map to some database fields. A good way to get started is to use other people’s software and take notes about tasks you’re trying to complete and what you actually need to do to complete them. In my email client, how many clicks do I have to make to reply to someone? How many labels do I need to read? How often do I need to switch between the mouse and keyboard? Does it help me in any way with common tasks (like “find all attachments from a specific person”)? (You’ll be surprised how hard it is to use software!). Stick to a few languages. Master them. If there’s a better solution in another language or environment only use it if gives you some really amazing advantage. It’s often not worth the extra effort to become proficient enough with yet another tool. Don’t underestimate what it means for a production environments: things have to be provisioned, deployed, security-patched and monitored. Use what works for you. If you’re productive in PHP, by all means, use PHP. Of course, sometimes technologies come along that actually measurably increase productivity or have other huge advantages, but it can’t be overstated how few and far between those are—perhaps one or two happen in a decade. Additionally, don’t step into the trap of believing that because there’s many variations of a specific technology that the underlying idea is a good one. It might actually be a sign of people trying in vain to find a technological solution for the wrong high-level approach. 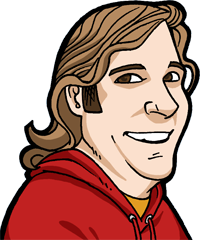 For example, client-side MVC, for almost any type of web application functionality, will add programming overhead (because there’s more layers and those require interfaces between them), lessen productivity (more code to write and the layers make debugging harder) and likely not actually improve the experience for users (user interface design is hard work and using client-side MVC will not magically do it for you). Just like languages, frameworks and libraries, the way you use a language seems to change like seasons. One month it’s put it all in closures and the next month your hear that closures are so passé. Reduce cognitive stress while coding and debugging so you have more time thinking about the actual problem you want to solve. It can’t be said often enough: when writing code, don’t write anything that the code doesn’t absolutely need in order to work. Don’t anticipate how you may extend the code in the future. It never turns out that way anyway. Concentrate on code that works, and write tests instead of wasting time on too much abstraction. Don’t forget: code is not written in stone. It’s easy to refactor or rewrite later when you do need to change or extend it and when you actually know the requirements. For example, I don’t use CSS or HTML preprocessors like HAML or Sass (if they work for you, awesome, please use it and be productive! )—my style of coding and refining apps involves a lot of tinkering and I have an easier time if I can mess with these things on a low level (for example, just copying and pasting styles I messed with in browser development tools into a CSS file directly). Avoid pre-fabricated solutions that only solve your problem the first 80%. You’re a programmer, not a configurator. Try tracking your time doing various jobs while programming, from thinking about how to implement a specific feature, writing outlines and todo-lists for implementation, picking tools and libraries and making prototypes with them over actual implementation, writing tests and iterating over functionality and bugs. You’d be surprised how little time you actually spend coding versus how much time can go into picking libraries. You might save a lot of time by just sitting down and writing code from scratch instead. Perhaps the best way to stay sharp is to occasionally do side projects, open source and perhaps micro-libraries. Experiment and tinker, so you don’t lose the joy of creating things out of nothing. What helps you write great software? Hit me up on Twitter and discuss! 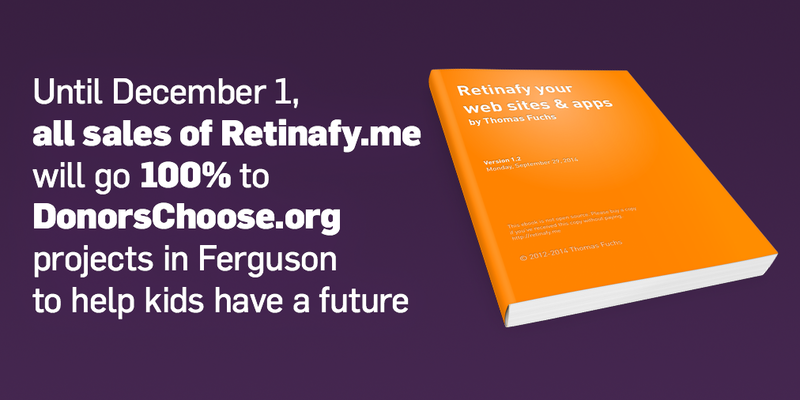 Up to and including Monday December 1, 100% of sales of my Retina Web ebook will go to Donors Choose projects in Ferguson, MO. These kids need our help! Thank you! 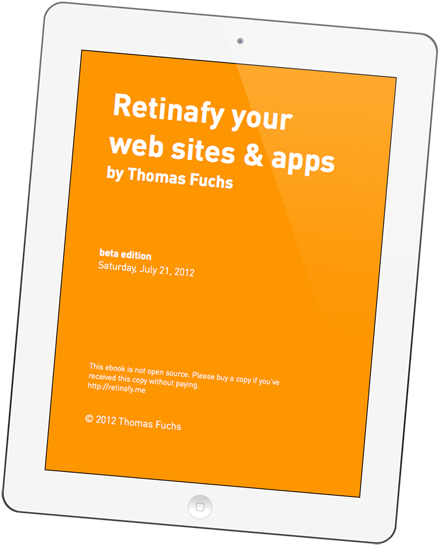 Webfonts are the new hotness, and icon fonts even more so. There’s plenty to choose from, and Google just released an icon font that’s based on the new Android L. Icon nirvana reached? If you serve icons from a service, that services might randomly go down. I’ve seen this over and over again with big and small websites. You can’t easily edit icons, and it’s hard to see what’s been updated in source code control. Webfont files are for the most part binary and changing one icon normally means the whole resulting font file is different. There’s blurry rendering on certain browsers. Some CSS properties have to be abused (like -webkit-font-smoothing: antialiased;) to make the icons look good. This doesn’t work in some browsers and in some browser versions. Most importantly, when icons are in the same CSS block, or when centered in an odd-width container, you get off by half-a-pixel blurryness, which can’t be corrected. This happens on all browsers, even on the latest and greatest Firefox, Chrome and Safari (even though Safari is doing better than IE, Firefox and Chrome, I’ve seen it happen on Safari as well). In Freckle Time Tracking we had a clever setup with SVG source files (on a precise 16×16 grid) and using fontcustom to compile fonts and doing some post-processing of the generated CSS with sed (most to remove unwanted font variants, as you only need woff in recent-ish browsers). We also required to add some special headers when serving these font files so that our CDN (Amazon CloudFront) would correctly serve them. All of this worked, but… blurryness alarm! Let’s take a step back and ask—what do you need from an icon? Why do icon fonts appear to be a good solution? And how can the problems be fixed? Icons need to be rendered pristinely and in focus. 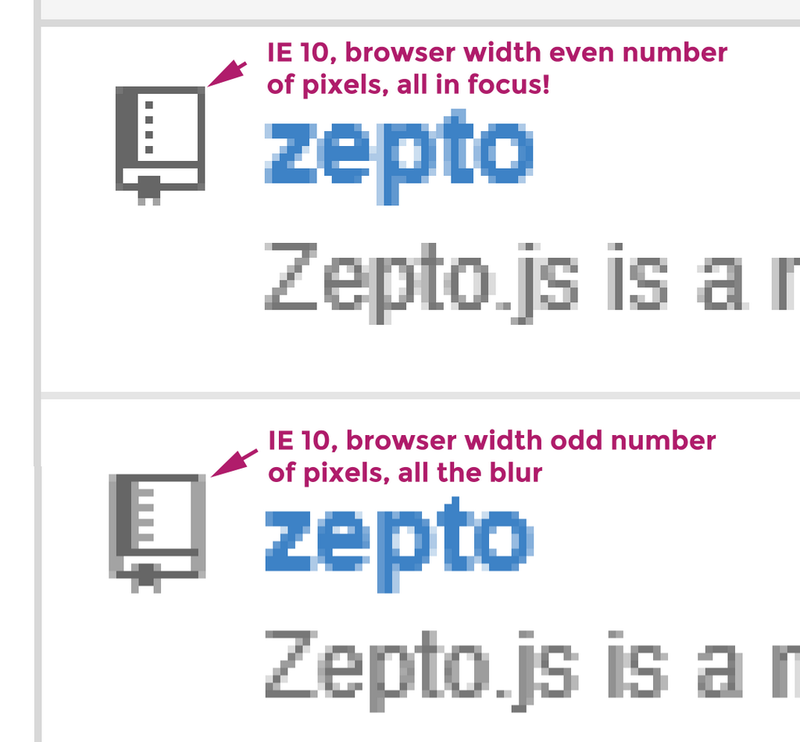 They should ideally be rendered the same or nearly the same on all browsers you support. You should be able to change the color and ideally other (CSS) properties. The same icon should look great on normal and retina screens; ideally you can substitute a different version for retina if you so fancy. We’ve a bunch of SVG files in a folder, which are our icons. All of them are on a 16×16 pixel grid. For the optimization, we use imagemin, which will remove unnecessary stuff from the source SVG files (these are all saved in Adobe Illustrator, which likes to be on the verbose side when it comes to saving SVG). them for special cases when you don’t want inline SVG but a normal image tag or a background image. To set the color of an icon in CSS, just add a fill: #abcdef; CSS property. Boom—problem solved. This works great on all browsers, and you don’t get any of the rendering issues that you have with icon fonts. When you copy+paste text, the SVG is ignored so you don’t get weird extra characters in the pasted text. There’s no weird “flash of unstyled text”, neither is there empty spaces that are only rendered when an icon font was fully loaded. Recently we upgraded our server infrastructure for Freckle Time Tracking and in the process wanted to improve how we serve SSL. Long story short, you’ll want to get an A+ rating on the Qualsys SSL Labs test. Don’t support older protocols. A lot of servers support really old and obsolete protocols. If you run a web app, your users will very likely not need support for these. Don’t support flawed SSL ciphers. There’s a bunch of these and you can avoid using them. Browsers support multiple different ciphers, so this is not a problem. Cache SSL sessions. This will improve performance. Turn on HTTP Strict Transport Security (HSTS). This is a special header that will tell browsers to never connect to the server via normal HTTP. And that’s it. Have fun with your new A+ rating on the SSL labs test. Our Internet isn’t big corporations doing whatever they want. Our Internet is not DRM, is not SOPA and not PIPA and not the spying on us (and everyone else). Our Internet isn’t bigots taking away human rights from people. Our Internet isn’t hiding behind PR releases. Our Internet isn’t greed, narcissism, fear and blind hate. Our Internet is people helping each other be excellent. It’s sharing, caring and being proud of what we humans can do if we only put our will to it. It’s about helping the unprivileged when governments fail. Our Internet is about standing up to your mistakes. Our Internet is about love and empathy. The only thing we have is each other.